This is a project I’ve been meaning to do for years, ahem since I first shared my work space with you guys. ugg. It was such an easy one I’m not sure why I kept putting it off. I have a few of those Ikea Expedit shelves as I’m sure many of you do as well. The thing is, I”m not really a basket girl and all the boxes and tote options just don’t do anything for me. I decided to cover just the front side of the box just to conserve fabric and since these boxes aren’t ever going to be hanging out in the open. I just pull them out for a minute or two and put them right back. But I’m sure you could use this same idea to cover the full box. Cut fabric for each box. If there are any parts of the box showing through cut white fabric to act as a lining and glue the white fabric in place. Fold the edges of the fabric around the box and glue and fold as you go trying to pull it as tight as possible. Cut slits in the handle hole. I used my rotary cutter to get in. Glue fabric around the hand hole. Tape the edges of the fabric. This is probably optional but the way I use these boxes I wanted an extra safeguard against unraveling and pulling. Look at your beautiful boxes and wonder why you didn’t do this sooner. I really really love my boxes. Sorry, I didn’t bother cleaning up for you guys but I figured I always love seeing other people’s work spaces so I did a zoomed out shot for you all. Can you believe I used to have that nasty paper printing showing? Oh man looking at the pictures in the old post cracks me up I’ve added a few tables and lots other crap haha. We are moving soon and I am dreaming up ways to organize the fabric and other mess that has taken over my dining room! This is PERFECT, I will totally be stealing the shelves and boxes idea, thank you. And also, thanks for not cleaning up–I love to see real life, not the cleaned up, staged version of your life, you know? Looks super cute. Amber that reminds me, I bought most of my boxes before I moved and used them for movie so that was helpful too! Great idea! I have some boxes I could spruce up with some fabric. Thanks for sharing! These are gorgeous! What a great room :) I love that you saved fabric and only covered the parts that show! I can’t wait to see what else you create. WHat I really love is that you shared your REAL space. Thank you! 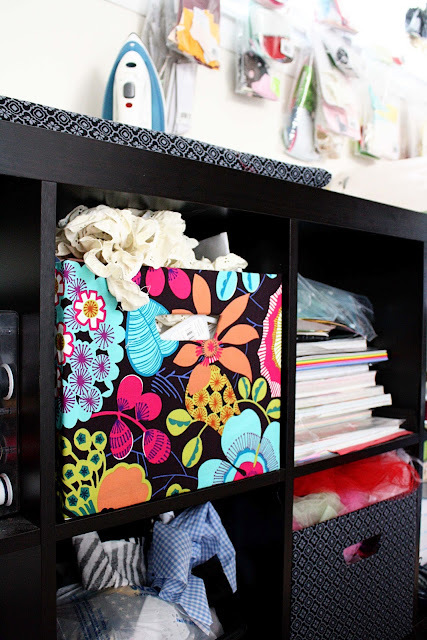 If I have to see one more perfectly organized, creative space, I might just quit blogging! :) LOL! ok, maybe I’m being a little dramatic. Love this idea! I’ve been searching for the perfect boxes to go under my son’s new bed- I didn’t think of DIY’ing my own. Thanks for the inspiration! New follower from blog hop! 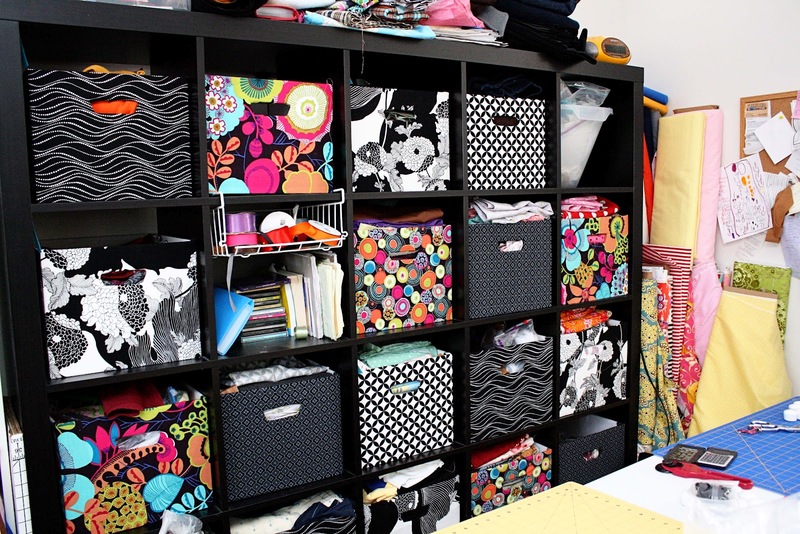 I am a very organized person so I love this idea. In fact, might have to try it for my daughters clutter! Those look so awesome! I would love for you to share this (and any other creations) at Pin It & Win It Wednesday (open now!) at http://www.cheapcraftymama.com! Wow – I love this. So gorgeous!! I love all the fabrics you used. This is such a great idea. I’m definitely pinning this. Thanks so much for linking up to Romance on a Dime!! I love these, they look so awesome! I would love to do this when I get my own place. Thanks so much for sharing at The DIY Dreamer… From Dream To Reality! awesome! That’s pretty much what my work space looks like too. I love seeing your craft room! I should show my husband just so he realizes lots of other people have just as much stuff as I do! The boxes are quite lovely with their fabric! I followed you over from Mix it up Monday and these look amazing! I love all the different color of fabric and you make it look super easy. Great boxes! I need some of these for my work space. I love your fabric choices. Thanks for linking up! These are awesome!! Such a great idea! such a great idea! boxes look great. Fabulous idea! I love all of the different fabrics together! Thanks so much for sharing at The Creative Spark – i’ll be featuring these today. Happy Sunday! Great job and I love the fabric choices!! Awesome idea! I’m featuring this on my new link party! Thanks so much for linking up!! Marissa – Definitely will be stealing this idea – no question. It’s soooo great! Love, too, that you only covered the front face. Who cares about the back and undersides if you generally never see them? By the way, thanks for introducing me to Goodreads. I ran right over there and signed up! Later, I’ll figure it out. Marissa, I love this so much, I’m featuring it on today’s Take it on Tuesday blog hop. Feel free to grab a featured button!! Thanks for sharing this great idea with us at The Sunday Round Up. I do like the shot of the hole room. I’m happy to others work spaces too. Love it!! The cool fabrics you used totally makes it!! Clever and creative!!! This is great. I love how a little thing like covering boxes can make such a difference. This is just the inspiration I need for our daughter’ play area. Thanks! 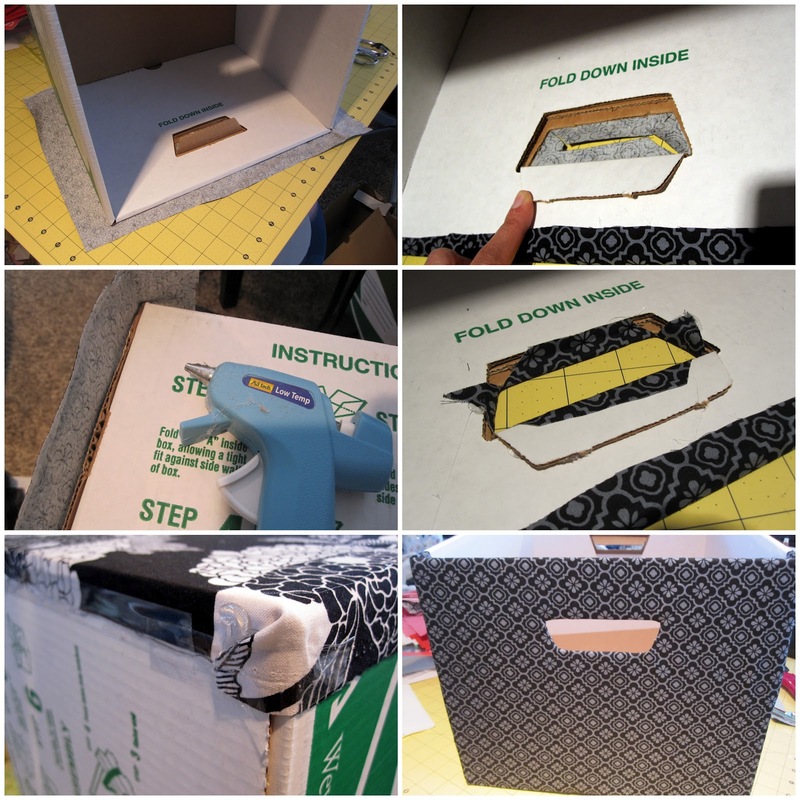 I love how you used regular boxes and turned them into something so pretty and usable…thanks for sharing this at Sunday Blog Love and this is one of my favorite picks! So glad you shared this and hope you’ll link up again this weekend! Have a super weekend! I love, love, love this style of bookshelf, but the baskets all turn me off, not a problem anymore!